Every Legal Detail You Need To Fully Understand, Secure And Protect A Patent Claim. Exceeds All The Criteria For A Valuable Patent Reference. 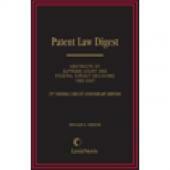 Covers all aspects of patent law and related issues. Thorough coverage of the substantive law - principles, doctrines, rules, and cases - gives you the convenience of one-stop research, written by the leading expert on patent law. Abstracts Of All Federal Circuit Decisions. Abstracts of all published decisions of the Court of Appeals for the Federal Circuit are provided in a topically arranged outline along with a chronological case table. 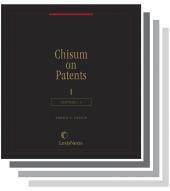 Chisum on Patents is recognized as the authority on U.S. patent law, being frequently cited by courts in all jurisdictions, the Court of Appeals for the Federal Court, and the U.S. Supreme Court. 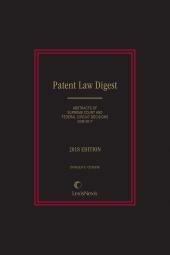 Chisum on Patents is written by Donald S. Chisum, who was Professor of Law at the University of Washington (1969 to 1996) and Santa Clara University (1997 to 2006). Chisum received his A.B. degree in 1966 and his law degree in 1968, both from Stanford University. Analyzes the substantive law of patents in the U.S.: patentability, validity, infringement, application procedure, and perfecting rights to an invention. Patent Cases are also available with this product. Donald Chisum was Professor of Law at the University of Washington from 1969 to 1996 and professor of law at Santa Clara University from 1997 to 2006. He received his A.B. degree in 1966 and his law degree in 1968, both from Stanford University. Mr. Chisum is the author of Chisum on Patents, a 53-volume treatise, which was first published in October 1978, and annual Patent Law Digest. He revises the treatise five times per year to account for developments in United States patent law. From 1997 to 2006, Mr. Chisum directed the Santa Clara Summer Institute on International and Comparative Intellectual Property, Munich, Germany. In 1989, he received the Jefferson Medal Award from the New Jersey Patent Law Association, for outstanding contribution to the constitutional goals of the patent and copyright systems. Mr. Chisum is Co-Founder of the Chisum Patent Academy, Inc., which provides high quality patent law training for junior attorneys or recent law graduates in a small group setting. Mr. Chisum has testified before the U.S. House of Representatives Committee on the Judiciary, Subcommittee on Intellectual Property and Judicial Administration, on the subject of patents in space (1985), the Transgenic Animal Reform Act (1989) and the Biotechnology of Patent Protection Act of 1991.